Liverpool 5 is a collection of five flash fiction stories. 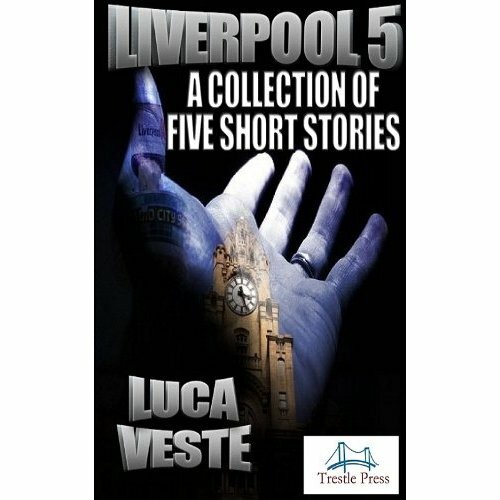 The stories are set in and around the great city of Liverpool. The stories are about life, death and the wafer thin relationship between the two to quote Luca. I’ll discuss each story in the order it appears in the collection. As this is flash fiction I’ll try to generalise so that I don’t give anything away. Dreams – This story is perhaps my favourite of the collection. Luca makes a great point about life, friendship and relationships in this story. A heart warming and beautifully melancholy tale. Model Behaviour – Social networks come under a lot of scrutiny. On the news you hear mainly negative things. But what if someone used it to reach out to you in a time of crisis? A fantastic observational story that makes you think. Heavy Sleeper – Now a couple of years ago I slept through an earthquake. This story sent a chill down my spine because I am a heavy sleeper. An excellent and darkly chilling tale. Peeling Spuds – A tyrant of a husband. A selfish pig who cares about nothing and no one but himself. Everyone has their breaking point right? Eloquently related from the start and with a very clever twist. He Ain’t Heavy – A tale of two brothers whose lives take them in two different directions which could turn out to have potentially dire consequences. What Luca Veste does best is give you everyday situations and make them interesting. He has the gift of the storyteller and you find yourself racing to get to the end of each story to see how it turns out. He has an uncomplicated style of writing and that is not a criticism. He uses this style to great effect to engage and hook the reader expertly. Trestle Press have once again signed up a cracking writer who I have no doubt will turn out to be the Steven Gerrard of their squad. Strong, solid always reliable and a great finisher.